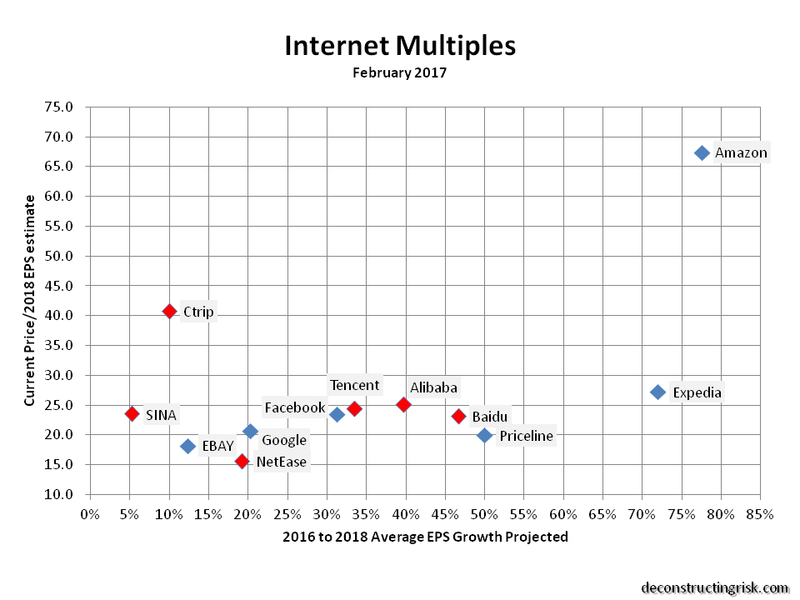 One lesson from the internet bubble is that big is beautiful in tech. But longevity is another lesson, think Yahoo! So one must be fickle in ones tech affections and one must never ever pay too much. After much patience, I was lucky enough to eventually get into Apple in early 2013 when sentiment was particularly sore. 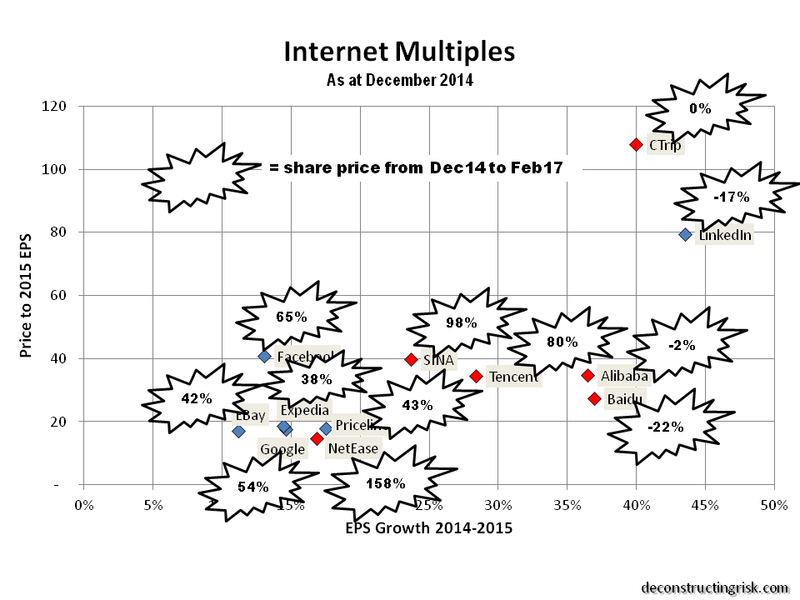 I didn’t manage to heed my own advice on getting into Google at a reasonable price in December 2014 when it was trading around 60% of its current value, as per this post on internet relative valuations (more on that post later). Since 2013, I have watched sentiment gyrate on AAPL as the standard graph I use below illustrates (most recent AAPL posts are here and here). I used the current $135 price high as the most recent data point for the Q12017 valuation. Investors and analysts seem giddy these days about the impact of Trump tax changes and the iPhone 10 year anniversary on AAPL and have been pointing to Berkshire’s position increase in AAPL as confirmation bias of more upside. I, on the other hand, have been taking some of AAPL off the table recently on valuation concerns and will likely again be a buyer when the inevitable worries return along the “one trick iPhone pony” lines. God bless gyrating sentiment! Even Lex in the FT was saying today that the current TTM PE ex net cash of 13 is reasonable (eh, a TTM PE ex net cash of 7 a year ago was more reasonable)! AAPL still has be a core holding in anybody’s portfolio but prudent risk management requires trimming at this price in my opinion. In my search for new ideas whilst I await some divine sense to emerge from the Trump & Brexit fog, I thought it would be interesting to revisit the post referred above on internet valuations. 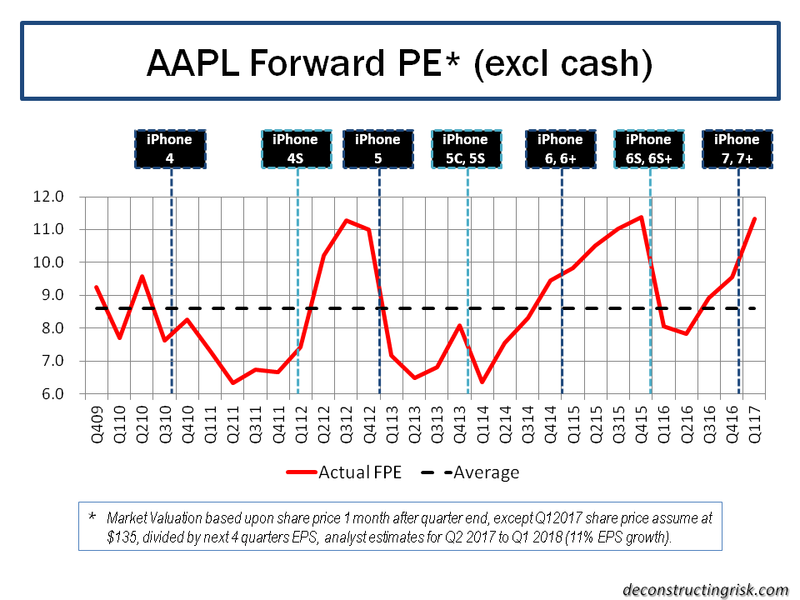 First off, I took the graph showing forward PEs to projected EPS growth using analyst estimates from December 2014 and inserted the actual change in share price from then to now. Two notable exceptions, at the extremities, from the graph below are Amazon and Twitter with share price changes of 173% and -56% respectively. Although every company is different and has its own dynamics, my simplistic take from the graph below is that high PE stocks (e.g. > 40) with high EPS projections (e.g. > 35%) can easily run aground if the initial high growth phase hits harsh reality. The sweet spot is decent PEs with EPS growth in the 15% to 35% range (again assuming one can get comfortable that the EPS growth projections are real) indicative of the larger established firms still on the growth track (but who have successfully navigated the initial growth phase) . A similar screen based upon today’s values and analyst estimates out to 2018 is presented below. This screen is not directly comparable with the December 2014 one as it goes out two years rather than one. Based upon this graph, Google and Netease again look worthy of investigation with similar profiles to two years ago. Netease has the attraction of a strong growth track record with the obvious Chinese political risk to get over. Expedia looks intriguing given the strong growth projected off a depressed 2016 EPS figure. Ebay and Priceline may also be worth a look purely on valuation although I have a general aversion to retail type stocks so I doubt I’ll bother look too deeply. All of the data used for these graphs is based upon analyst estimates which also need to be validated. Valuations currently are juicy, generally too juicy for me, so this exercise is simply one to determine who to investigate further for inclusion on a watch-list. Time permitting!